Electronic medical records and practice management requires the utmost care when designing the network environment in which it will run, maximizing security while permitting essential function. 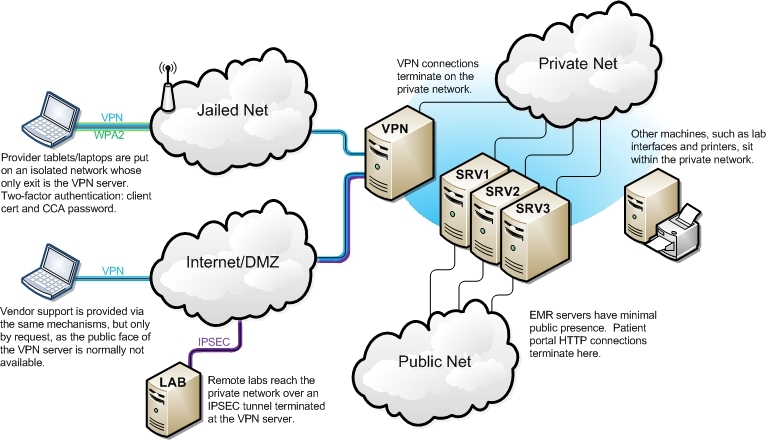 Providers use tablets on a jailed, WPA-2 protected network, which in turn requires two-factor OpenSSL VPN authentication and service group authorization to pass through the gateway. Connections terminate on another private, completely isolated network on which the EMR servers reside. Additional equipment, such as printers, are also housed here. Public access is completely limited to web functions needed for patients. Remote vendor support uses the same mechanisms for authentication, and there are additional ipsec tunnels setup for remote labs to secure transmission to and from local resources. I additionally negotiated with the vendor for the implementation of a token-based authentication scheme to allow for transparent authentication from our campus portal.